To me, Mercer University always had a good reputation. It has some distinguished alumni and prominent persons on its faculty and Board of Trustees. 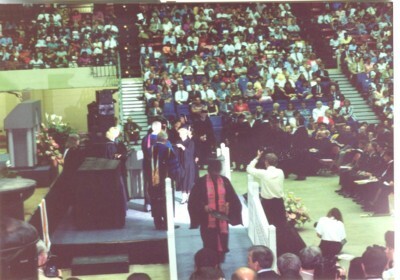 Mercer became even closer to my heart when my only child, Jennifer, enrolled there as a freshman in 1989. She attended the college for four years and graduated in 1992 with many relatives present! It is sad that the Georgia Baptist Convention has stopped its funding. In the long run the Baptists will lose the most from this “divorce”. Mercer is growing. I am not always sure about the Fundamentalists. The new president seems highly qualified. Maybe he can cool some of the flames that have been ignited during the tenure of activist President Kirby Godsey. I am proud that my daughter is an alumnus of Mercer University. New Mercer University President Bill Underwood, right, talks to the outgoing president, R. Kirby Godsey, following Underwood's selection Friday in Greene County. Mercer University's new president, Bill Underwood, plans to follow in predecessor R. Kirby Godsey's footsteps, while also maintaining the school's Baptist tradition and making it better, richer and more nationally renowned. Introduced Friday to Mercer trustees, Underwood acknowledged the tough road ahead: He said a friend told him, " 'Only a fool would try to follow Kirby Godsey.' "
"Well, you're looking at that fool," he said. Underwood was introduced Friday as the 18th president in Mercer's 172-year history at a news conference at the Ritz-Carlton Lodge at Reynolds Plantation in Greene County. The 15-member search committee voted unanimously Thursday to recommend Underwood to trustees. Friday, the trustees unanimously accepted that recommendation. Godsey, who will step down in June, has been president for 26 years, during a time of rapid growth for Mercer's budget, enrollment and endowment. If Underwood's task is daunting, search committee chairman David Hudson made that group's choice sound easy. Hudson said that after the group first met with Underwood in October, one member said, "Call in the dogs, put the water on the fire, the hunt is over." Underwood is a longtime trial lawyer and law school professor at Baylor University and has been Baylor's interim president since June 1. Hudson, the Augusta attorney who was elected chairman of the board of trustees Friday, said his search committee interviewed other candidates, but it did not pick other finalists. He said the committee was impressed by Underwood's energy, intellect and commitment to "excellence in higher education in a Christian context." He said trustees expect Underwood to continue Godsey's commitment to academic freedom and diversity. He noted Underwood's own Baptist heritage - he is the son of a minister. He said, "Kirby Godsey is one of the great leaders in Baptist life." Hudson said trustees have asked Godsey to continue in some role with the university "for the remainder of his active years" - starting, perhaps, in the new position of chancellor. Godsey, 68, said he also expects to remain active both in Mercer affairs and community activities in Macon. Underwood will remain Baylor's interim president until Jan. 2. He may teach a course at Baylor this spring, but he also expects to be spending time in Macon and at Mercer. He was accompanied Friday by his wife, Lesli, a third-grade teacher. Tuesday was a sad day both for Georgia Baptist people and Mercer University. That's when a majority of the 1,800 "messengers" (delegates representing churches) at the Georgia Baptist Convention meeting in Columbus voted to sever ties between the convention and the school. It will take another vote at next year's session to make the divorce final. But the die seems cast. The action reflects what has been going on in the Southern Baptist denomination nationally. Conservative leaders and churches attempt to exert authority over more liberally oriented educational institutions. Those push back in the name of academic freedom, accreditation or "soul freedom." A number of historically Baptist colleges have severed ties with their state conventions. Some jumped, others were pushed. Lawsuits were often involved over property or over who would choose the trustees, the people who hire and fire school presidents. Some, like Mercer, are regarded as the "flagship" institutions of Southern Baptist higher education in their states - Wake Forest University in North Carolina, Furman University in South Carolina, the University of Richmond in Virginia. Under his predecessor Rufus Harris, and particularly during the tenure of President Kirby Godsey, the guerrilla warfare between the school and religious and social orthodoxy sometimes escalated into open hostilities. In a 1996 book Godsey threw down the gauntlet before the conservatives (fundamentalists to their foes) who had taken control of the Southern Baptist Convention by trenchantly disagreeing with some of their pet theological positions. 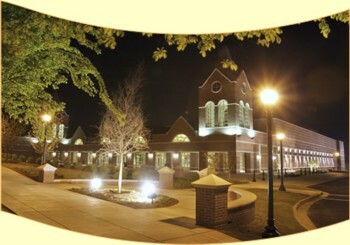 Mercer opened its McAfee Theological Seminary in Atlanta as an alternative to the taken-over Southern Baptist institutions. These and other actions led to angry resolutions and even official condemnations. But after each flare-up, peace papered over the simmering beneath. The last straw for the convention came when Mercer allowed a gay-straight alliance not only to exist on campus but to hold a "Coming-Out Day" Oct. 1. The relationship between the university and the convention, one told the messengers, has come to lack "common values" and "mutual trust." In the end the schism is not over whether Mercer is a good university, but whether it hews to a super-orthodox line academically and presents an image that conservative Baptists feel comfortable with. Mercer will miss the spiritual checks and balances imposed during its long existence in tension with would-be imposers of orthodoxy. The Baptists of Georgia will miss the leavening influence of linkage with an institution dedicated to protecting not only its own academic freedom (and accreditation), but the "soul freedom" Baptists historically have insisted upon to the point of martyrdom. The Georgia Baptist Convention voted Tuesday to sever ties with Mercer University because it no longer shares "common values and mutual trust" with the Macon-based school. The decision, which Mercer's president called "tragic," represents the ……. The vote, taken at the group's annual meeting in Columbus on Tuesday, won't become final until a similar vote is taken next year. J. Robert White, the convention's executive director, declined to comment. But the Rev. Fred Evers of Tifton, who submitted the motion, said the existence of a gay rights group for students at Mercer contributed to the convention's decision. "The relationship seems void of common values and reflects a lack of mutual trust," Evers said, addressing the assembly. Mercer, founded in 1833, has been the leading Baptist school in Georgia. The liberal arts university, which has an enrollment of 7,300 and an annual budget of $39 million, also has a campus in Atlanta. R. Kirby Godsey, the school's president, pleaded with convention members not to sever ties, saying they should not misread the existence of a gay rights group on campus. The group, called the Mercer Triangle Symposium, was formed in 2002 but disbanded Monday after convention leaders complained. "Mercer University has never promoted, advocated or encouraged gay or lesbian behavior," Godsey said. "Discussion, yes, but encouragement, never." He later called the convention's decision "a tragic mistake." Godsey's leadership, in fact, was another reason convention leaders cited for cutting ties. 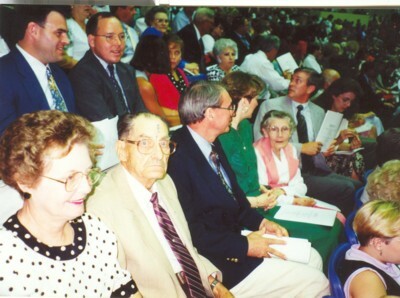 A moderate within the country's largest Protestant denomination, Godsey angered some convention members with a 1996 book that said the Bible is not infallible. He is scheduled to retire next year. The prickly relationship is rooted in a 25-year-old conflict between moderate and fundamentalist Southern Baptists. Fundamentalists took over leadership of the Southern Baptist Convention in 1979, and since then state Baptist conventions have gained control over several colleges. Others, such as Baylor University in Texas, fought to maintain a degree of autonomy, fearing a loss of academic freedom or accreditation. The Georgia Baptist Convention, which has more than 1.3 million members, this year gained control of the board of trustees of Shorter College in Rome after a four-year court battle. If the Mercer split is affirmed with a vote next year, the convention will likely withdraw $.5 million in annual funding. Augusta lawyer David Hudson, a Mercer trustee, said the convention voted as it did because it can't control the selection of Mercer trustees. The school's bylaws grant that power to the school's leaders. The action will hurt students most, Hudson said, because the money is used for scholarships for needy Georgia Baptists. "It's almost like saying we don't like Mercer so much that we're going to put a stick in our eye," Hudson said. David W. Key, director of Baptist studies at Emory University's Candler School of Theology, said that Tuesday's action had been in the making for years. He said the convention is run by fundamentalists who cannot reconcile their belief in scriptural infallibility with the mission of a university. "That's the purpose of higher education, to open minds," Key said. "That runs counter to a fundamentalist's theology." Hudson, a fifth-generation Baptist, said the convention's action ultimately could leave Georgia Baptists who love both Mercer and their denomination in a bind. "Mercer is the thing that Georgia Baptists have done together better than anything," he said. "It's a jewel. Why wouldn't they take pride in it?"